Get all the benefits of having a local mobile phone in two countries from just one SIM card. With 2 Countries 1 SIM your Vectone SIM works like two Vectone SIMs. This free service gives national numbers in two countries, local rates for calls, texts and data in two countries, and lets you receive calls in two countries at no extra charge. Be a local in two countries at once. Use one SIM and get a mobile number in two countries. If you split your life between two countries, regularly visit home or have many friends and family in one of our countries, then Vectone's free 2 Countries 1 SIM is ideal. With one SIM that acts like two, you can effectively be in two countries at once and get all the advantages of a local SIM card with only one Vectone account. So not only do you get a local number that people can reach you on whichever country you're in, but you can also enjoy Vectone's cheap standard rates when calling. Simply register a second mobile number on to your existing SIM. Call Customer Services in France on 740 or 0759999740 from your Vectone Mobile phone. Accounts: Both numbers work off the same Vectone account, so you only have to top up one account to use both numbers. Activation time: Activation is within one working day for customers with a new version SIM. 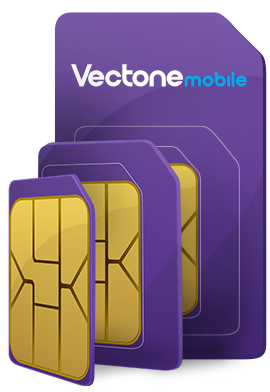 Activation is only available for the current generation of Vectone SIM card – if you have an older card we may have to send you a new SIM. To take advantage of the offer you must accept the Terms & Conditions for more. Vectone 2 Countries 1 SIM/ 2 in 1 SIM (feature) adds a second Vectone number to an existing RS SIM allowing you to use the Vectone network and to receive in a Vectone number in additional countries. Availability: Only available to Vectone pay as you go customers and only one 2 Countries 1 SIM allowed per customer. Exchange rates: Conversion of amounts in your account from RSD to Euro etc (and vice versa) will be made according to the conversion exchange rates published on our website. Second country limitations: No special offers apply to the second country mobile number. In this case only the standard local rates are available. Use of any of Vectone services requires acceptance of Vectone Standard Terms and Conditions.